The Fairy Tales of Mother Goose, author unknown, composer Alfred Mellon. Lively Jack was Sarah Woolger. Here she rescues Little Red Riding Hood (Mary L. Keeley) from the wolf (Paul Bedford). Mother Goose was played by Miss Wyndham. 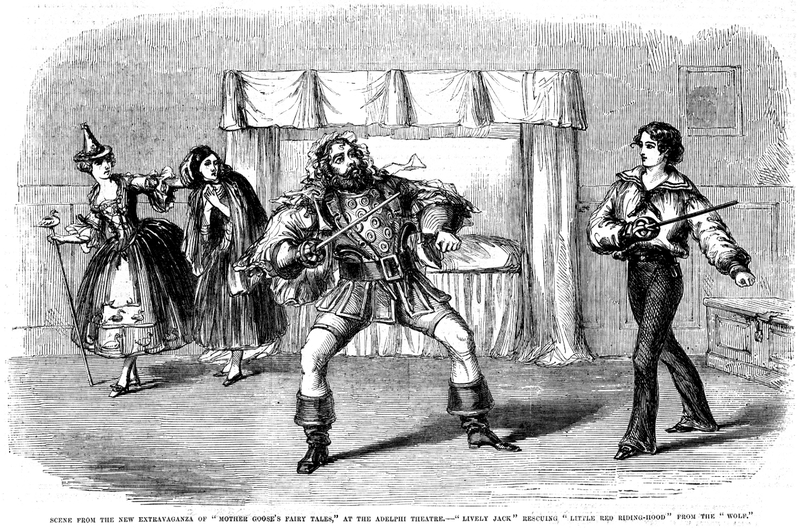 The scene, which we have this week presented, has for its subject the contest between Miss Woolgar as Lively Jack, and Mr. Paul Bedford as the Wolf, in the story of "Red Riding Hood." Mother Goose herself, admirably impersonated by Miss Wyndham, forms part of the group, with the heroine, so interestingly represented by Miss Mary Keeley. The contest is most perseveringly maintained on the part of Miss Woolgar, who wins the triumph by indomitable and persevering energy. The thorough-going air and spirit which this inimitable actress lends to all such characterisations require the exercise of a peculiar art, melodramatic in its basis, but not to be obtained without prolonged practice. The art demands, indeed, the perfectly experienced actress; yet they are, after all, thankless parts. But Miss Woolgar has, from the beginning, consulted the advantage of the theatre in preference to her own, and has, we believe, as she well deserves, found her private account in it. The public are as much indebted to her for her kindness as for her talent. The courtesy of visiting each other's houses, now adopted by the managers of our theatres, is one that be accepted as the test of our present civilisation. Mr. Webster and Madame Celeste make their appearance here, while Mr. Phelps is enjoying the honours of a guest on Mr. Creswick's boards. The favourite Adelphi piece introduced to the Islington audience on Monday was well received The "Green Bushes" is a stock attraction in the Strand, and its merits are such as to command recognition wherever acted. Madame Celeste's Miami is an interesting conception, romantically realised, and one which always displays the best points of this artiste's acting. It touches the feelings with extraordinary power; and, aided by the situations which the dramatist has so adroitly contrived, enforces an irresistible appeal on the sympathies. Madame Celeste evidently aimed on this occasion to commend her art to the judgment of an audience now so long accustomed to the highest drama; and her success was complete.